This is your life - Trams 18 and 40 - looking at the working lives of Ballarat's tramcars No. 18 and 40 from the time they commenced work in Melbourne for the Prahran and Malvern Tramways Trust. A Powerpoint slide presentation - 10MB. First published in the August issue of Fares Please! "Forest City" Signals in Ballarat - looking at the "safeworking" systems that applied in Ballarat, the first being the hand staff system. As a result of four serious collisions, the “Forest City” colour light system was adopted and this system is examined in detail. The Begonia Festival 60+ years - an illustrated article explains why the Begonia Festival was organised, looks at the first festival of 1953, discusses changes over the years and looks at the role of Ballarat's trams. Ballarat Horse Trams - Still_at_work - telling the story of the Operation of Ballaarat Tramway Company Horse Tram No. 1 by the Ballarat Tramway Museum. 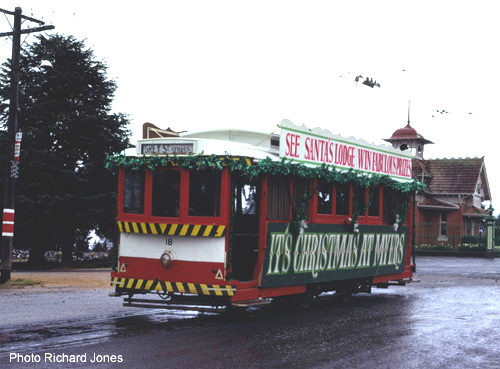 Santa_Trams in Ballarat - telling the story with photographs of the State Electricity Commission era of Ballarat's Santa Trams. Your story and photos are welcome too. 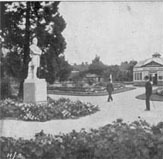 Ballarat Botanic Gardens and its Trams - Celebrating over 150 years of the Gardens - a photo essay looking at the way the trams have served the Gardens since 1887 - updated to 2011.